Resource Planning sounds like a simple concept. To ensure that you have the right people in the right place at the right time. But if it was that simple your entire workforce would have 100% productivity and engagement. Even in a small business, retail unit, call centre or manufacturer there are so many variables that you need to predict. Now you may be considering paying a company thousands to help you with this, or you just rely on everyone trying their best, but you do need to consider this and you don't need to spend huge sums of money doing it. Retail - spend a week capturing the number of customers coming into your shop, doesnt have to be exact. Also if you have a till roll with time stamp this will show when customers purchased things so just enter into a spreadsheet. Call centre - use your call log sheet to show the arrival rate of calls, ensuring it is when they called and not when you answered, if you have call waiting technology. Manufacturer - log when each item is produced ideally both start and end times. 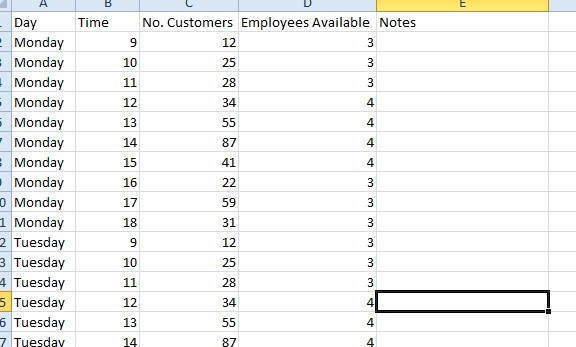 This is the amount of employees you have in your business at any one time. 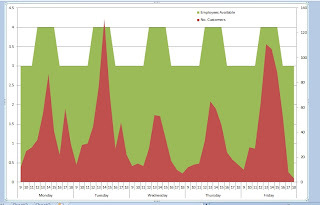 With this information you can do a quick analysis to determine what wastage there is and then amend your shift patterns or workflow accordingly. Now one thing to remember is that in a customer driven business you cannot amend the arrival rate as that is determined by other peoples decision making of when they wish to use your service, however you can encourage them to a more suitable time. e.g. A coffee shop is busy between lunch hours of 12 till 2pm. There is a customer who comes in everyday at 12.30 and waits to order 3 sandwiches for the hairdressers along the road. This customer could, call ahead and you could do the making of the sandwiches prior to 12 saving both you and the customer time. You can see there is some disconnect between arrival patterns and available employees. This would highlight when certain tasks like stock check, cleaning, reviews, back office activity, etc could be completed during less busy times. Alternatively it could show you when you are overstaffed and allow you to reduce your wage bill by removing some hours. 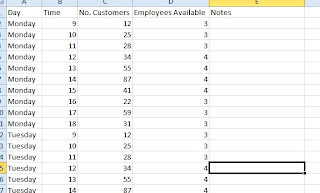 This is a quick excercise to determine how well your current Resource Planning is working.